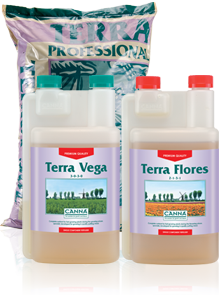 Since they were launched, Terra Vega and Terra Flores have become the most used nutrients worldwide for cultivating short cycle and fast growing plants in potting mix. CANNA TERRA’s composition has been adjusted to suit these type of plants needs. Terra Vega and Terra Flores contain all the nutrients needed in a form that can be absorbed directly ensuring that optimal intake is guaranteed from the start of cultivation. When the TERRA nutrients were in development considerable attention was given to the interactive processes that exist between the feeding and the growing medium and because of this you should have no worries about the quality of CANNA nutrients throughout the entire process of cultivation. The development of vital, young side shoots and good root development is characterised by healthy, fast growth. This is the basis that’s needed for achieving top results. Terra Vega contains all the nutritional elements that the plants need during this phase. Terra Vega works universal and is suitable for use with all types of potting mixes. It is certainly desirable that all the nutritional elements that the plants need should be directly available in the correct proportions during their exuberant flowering phase. It is for this reason that Terra Flores contains all the nutritional elements that the plants need during the flowering phase. The plants’ need for nitrogen reduces just as their need for potassium and phosphate greatly increases during the growing phase. In order to accommodate these changing circumstances Terra Flores contains the correct quantities of all the trace elements that are needed to meet the plants’ requirements and so to ensure superb flowering. 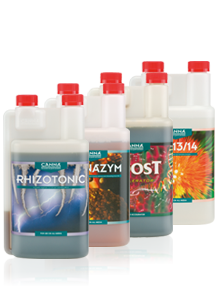 CANNA Terra Professional is an enriched growing medium that conforms to the strictest RHP standards. It distinguishes itself from other substrates through its use of first class raw materials, its fine structure and its purity. CANNA Terra Professional is an organic product that has a homogeneous structure, is 100% natural and is free from damaging viruses and potting mix diseases. It has a complex water/air system, which creates the ideal conditions for almost every method of cultivation, and after use it makes an excellent potting mix improver. In a root system that is functioning properly some roots will die off and new ones will form. The dead roots form an ideal food source for pathogens. Once pathogenic fungi have multiplied in the dead root material they form a threat to the healthy roots, which can be easily attacked causing a sharp decline in the roots functioning. As a result of this the entire plant will be put in a stress situation and growth will be stunted. CANNAZYM can best be used to prevent this. The enzymes in CANNAZYM ensure that dead root material is quickly converted into minerals and sugars. This is important because these elements form an important nutritional source for the plants and the soil environment. Also, rotting produces poisonous materials, which will be counteracted, and the chance of infection arising caused by pathogenic fungi is reduced considerably. As well as this, a number of easily absorbable vitamins have been added to CANNAZYM, which will stimulate the plants to produce new roots. For these reasons CANNAZYM should be continually added to the feeding solution from the second week of cultivation diluted at the ratio of 1:400. RHIZOTONIC is a powerful, vegetable based root stimulator. It causes extra root growth and in this way helps the plants to become established more quickly. For this reason RHIZOTONIC is an ideal product for cuttings and plants that have to be potted or for plants that have developed badly after being in a state of shock. As well as this RHIZOTONIC contains a wide variety of trace elements that are advantageous for the plants. The first 2 or 3 times that you use RHIZOTONIC you should add it to the feeding water in the ratio of 1:250 or spray it on the leaves. PK 13/14 is a pure, high value mix of phosphorus and potassium that is given frequently during flowering. It is given to the plants along with the feeding 3 to 4 weeks prior to harvesting. During flowering the plants need extra phosphate (P) and potassium (K) and giving PK 13/14 will satisfy this need. PK 13/14 dissolves very easily and is consequently immediately available to the plants. To get the most out of this product use it along side CANNABOOST. This truly optimize your results!